There may be some repairs that you can manage on your clothes dryer without a professional repairman. This is a guide about repairing a dryer. You don't need to buy a new dryer, repair it. I got a very high estimate on repair of the drum of our 30+ year old Kenmore dryer. ($235). The part was $33, a belt. The new dryers we looked at were too wide to get through our doors. So, using a plain ole' flathead screwdriver and the instructions on Ehow, I began to dismantle our Kenmore dryer. Use a strong lighting source, and buy the belt at an appliance parts store. Shop around - I did not buy the $33 one, but found one for $20 in a closer location. After exposing the innards, I realized it was no more difficult than replacing a vacuum cleaner belt. Just more time-consuming. In the end, I was very pressed for time and phoned a repair person. (no, not Sears!) Their estimate was 1/3 of the estimate from the first place. The time spent on my job was less because I'd already dismantled the dryer. So I combined DIY and an good repairperson. I learned something, too: older dryers, like our 30 year old dryer, have metal parts that don't wear out easily. Newer dryers have plastic parts that wear out in 5 years, requiring a service call. So, look on Craigslist or other swapping sites (freecycle, etc) for old dryers that are free. I learned that dryers, despite all the bells and whistles, well there is not a whole lot of difference, but a new dryer can cost over $1K! I am having issues with my dryer leaving what looks like oil spots on a lot of my clothes that will not wash out. I have tried to eliminate all possibilities, cheap detergent, dryer sheets, even filling the washer with water and detergent before adding clothes. It doesn't happen to all my clothes, but enough. Is there anybody that has experienced this type of issue, and if so, how did you resolve it. Any info will be greatly appreciated. Call a repair man your motor in the dryer could be causing it, or leaving lip stick or pens in your pockets. There might be some oil leaking from the motor through the vent in the back of the dryer into the rotating drum. This is just a thought that came to me. Come to think of it, I believe the motor is on the bottom. Could some oil be leaking in from a drive shaft that turns the drum? Are you sure it is from your dryer? I have had that before and found out it was because the transmission from the washing machine had gone out and was losing the oil in the drum, splattering all of my clothes. It was more noticeable on my whites. I hope this isn't the case but it might be a possibility. Good Luck. Do you use liquid fabric softner? It can leave spots - I've always been able to get them out by rewashing. Sounds like your washer or dryer is leaking oil. You will probably have to call a repair man for this one. Happens to me too! I notice the spots on dark blue or black t-shirts mostly. 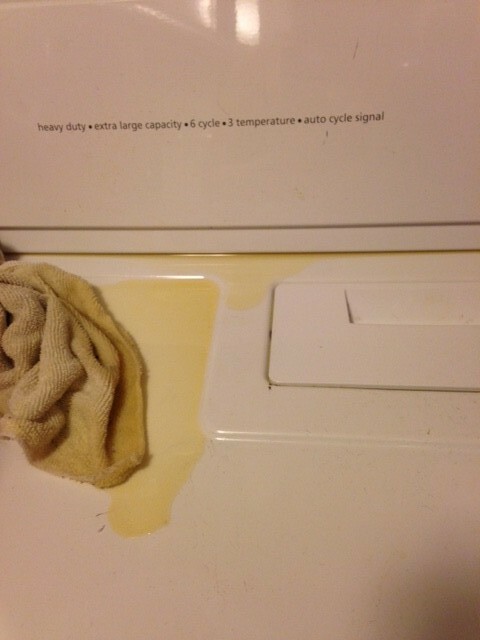 I really can't believe that my washer and dryer are leaking oil because my old machines did it too. New machines, same oily spots!! I thought this only happened to me. At least we know we aren't crazy!! I had the same problem. I have a brand new wash and dryer. I just thought it was my old one. I think it is from liquid fabric softener. When I rewashed the clothing it came out. I now only use dryer sheets for my darks and haven't had any problems. and not in the dispenser helped. Rewashing the items removed them for me. I have been having this same problem for months now, I don't use liquid fabric softner, I have had both machines serviced, it seems to only happen to mine and my 18 month old's dark clothes. Ah! I've tried washing and drying inside out, nothing seems to work! I'm starting to think it is something in my water! Sorry I can't help, can anyone else? I don't use liquid fabric softner or dryer sheets but do use laundry soap WITH softner, could this be the cause? I am hoping someone out there can help me. I am desperate for some good electrical advice. About 2 1/2 months ago my dryer stopped working. I assumed the dryer motor went bad because when you pushed the button for it to start it just hummed at you. After verifying that the belt was still good we disposed of the dryer. I was then given a very old dryer that was said to be good. It did the same thing as my old dryer did so I disposed of that one as well. I have now just purchased a used dryer and guess what, it also just hums when the button is pushed to start it. I then took this dryer to my mothers house and it works just fine. I have replaced the breaker in the breaker box thinking there was a problem there. I have tested the voltage in the receptacle and everything tests good Any ideas what could be wrong and what I could do to fix it? I can't really afford to have an electric company come in and find the problem. Any suggestions for a solution would be appreciated. I would check the circuit breaker. Believe it or not, they do go bad. You just pop it out and pop a new one in. Cost is minimal!!! Sending hugs of understanding for your frustration! My husband is an electrician, and after reading your problem and the few replies, here's his suggestion. Check the neutral in both the breaker box and the receptacle because the neutral is very important. The control uses 110 (one leg & neutral). The heating element uses 220. Test from one side of the 220 to the neutral - the slant hole to the L shaped hole of the receptacle. Hope this makes sense. I tried to translate from electrican talk. He also recommends a Time Life Book "Fix It Yourself - Major Applicances". It has very basic, but very well written, easy to understand photos, diagrams and instructions. You could call your local vo-tech school. Sometimes their students will come out and make repairs for low cost as part of class. Also, call your IBEW, electrician's union, and see if they are training any apprentices. They too may do the work cheap as a learning experience. I have now tried a new wire from the breaker box to the dryer and a new receptacle and that still has not fixed the problem. As stated in the original post a new breaker has already been tried. Voltage has been tested on both the old wire as well as the new wire and that all test out good. The best advice you should follow is to call a LICENSED, INSURED, QUALIFIED Electrician to fix your problem. By doing this you will be able to sleep knowing that it was done right the first time.